Yesterday Rasmus came back from Australia full of new inspiration and possible future cooperation. 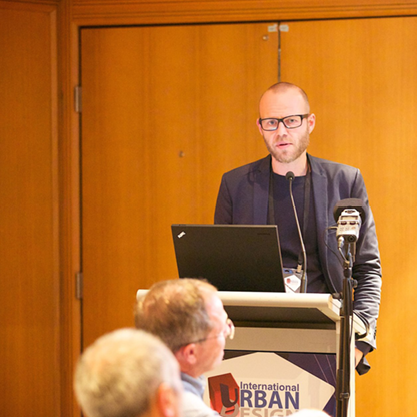 The lecture at the International Urban Design Conference was a great success, with a room packed with people, who listened, fully engaged, to our democratic design approach. The audience was in particular interested in our arki_tools, because it inspires them to engage the citizen in the city in a new way. Here, in arki_lab, we believe that cities should be constantly shaped and transformed by people. When designing urban spaces, the focus should be put on engaging people in all the design stages. The attention of the architects and urban planners has to be shifted towards the processes of urban formation instead of being stationed on the final product. Furthermore, the outcome of this process should be adaptable and responsive to the changing needs of the users. “On the institutional level, participation has become a hollowed concept where the citizens can vote ‘yes’ or ‘no’ at a public hearing. The conventional participatory planning practices, limit the influence of the people to the very first stages of design, and exclude them from further stages. Consequently, our cities remain to be the product of architects and urban planners, instead of being the outcome of an engaging process involving the users. It is this kind of thinking that arki_lab challenges in its attempt to make socially sustainable Democratic Urban Design focusing on building cities with people”. “We want to redefine the role of the architect not as the genius of aesthetic forms and proportions, but as the mediator between the professional world of expert-groups of architects, engineers, stakeholders, municipalities, investors, etc. and the actual everyday users”. What we have learned from experience is that people are not always consciously aware of their own perceptions of their city, their actual needs or what they want in their urban spaces (Seamon 2000, 1980, Merleau-Ponty 2009/1945). To access the phenomenological life-world of the citizens we need carefully constructed tools. “This has led to the use of different arki_tools, a set of easily adaptable tools for user engagement and participatory design processes counting: arki_nopoly, a board-game facilitating a design process; arki_boxes, 1:1 prototyping that gives shape to citizens concrete ideas in a specific area; CoCityApp, a digital platform for collecting data of citizens use of the city and empowering them in making collages about places they wish to change. It is our hope that these tools, as consequences of our collaborative approach to urban design and architecture can be an inspiration for all to how we can change our perception of architecture to something living we do together. We hope this can be a first step towards a global movement of building cities with people”. Stay tuned if you want to read the whole paper – it will be published very soon!